The great thing about blogging is you get to share your musings with the world. Today I’m musing about an absurdity that has me amazed. Let me explain. Today is Sunday, and the larder is nearly empty. Why? Well, Thursday was grocery shopping day, but there were ferry-boat issues. Getting off island was nearly impossible. Result? The small local grocery store had been picked clean. Sigh. Now, we live on an island off the coast of a larger island off the northeast coast of North America. My small island was once renowned for its food production and should be self-sufficient, but we’re a long way from it. Why? Check this. If I sit quietly, I can hear the roar of my neighbors ride-on lawn mower. Wait, that’s too much noise, the neighbor on the other side is on her ride-on lawn mower too and so is the guy beside her. Of the four houses visible from here, including mine, there is not a single vegetable growing. People in North America spend thousands each year to groom lawns that they cannot eat and will not allow livestock to graze on. No, instead we pay fortunes to large agri-business to ship food to us that has been so genetically altered that our bodies can barely digest it. You wonder why cancer and heart disease is rampant in our society; just look at the food supply for your answer. For me the answer is easy. I’ll manage to fill the larder tomorrow. I’ll buy whatever I can from small local producers and live with the rest, but, if I’m at all able, next year will see a big garden where the bulk of our current lawn now sits. We, the people, have to take back the food supply and get it into the hands of small family farms again. This is swiftly becoming a matter of survival. Final insult to injury, now I have to go mow the gorram lawn before the neighbors have me arrested. In the ROW80 department things are slowing down as I try to jump from one project to another. There are fixes and re-writes on Exodus From Nova as well as leaping back to Earth for a bit of romance. We’re hoping to get the next romance out in October. You know, I love sci-fi and romance, maybe I should be writing sci-fi romances. What do you think? Well, that’s it for me this time. I hope you all are leading blessed lives. Let me know how you’re doing; I do love to hear from you. Writing first! Yes, write sci-fi romance! Sounds like fun. When all else is done, I pick up my Kindle and read something not too violent and not too earthy that will take me far away. Meanwhile, edit, write, and rewrite. Celebrate the steps that take you forward. Now about those beautiful lawns: When we were living in Ecuador for a time, our neighbor brought over a goat (we didn't have one) who kept our 'lawn' tidy — and ate socks if I left them outside on the drying line. We commonly saw goats and cows tethered along side the road to graze. What a better solution. Now we're downsized to apartment with a shady patio. Not even container tomatoes, but we do have a farmer's market. Maybe that's your solution on your tiny island — a co-op farmer's market! May your writing go well. Meanwhile, please go to my ROW80 blog at http://bethcamp2.blogspot.com (not Google this week) Thanks! If Sci-fi romances appeal to you, you should write them. Nurse your passions freely. That goes for gardening too. You could always do what I suggested to our fellow ROWer/WANA, Shan Jeniah, when she moved into her home (there is a ordinance on all the houses that they could not have food gardens in their front lawns). I gave her a book about salad gardens that showed how to plant colored lettuces in rows and patterns like one of the fancy geometric designs of classic boxwood gardens. I suggested plants like nasturtiums and borage and violets… An ornamental (but still provides edible fruit) peach tree is surrounded by lavender plants in our front yard. Behind it, I planted an arbor of Concord grapes. At the worst, though it involves some work, let nut sedge take over for a bunch of the grass in your lawn. It mows like grass, but if you dig it up, it makes little corm-like bulbs that are delicious in pilafs and oatmeal (it was used by the Native Americans for food). 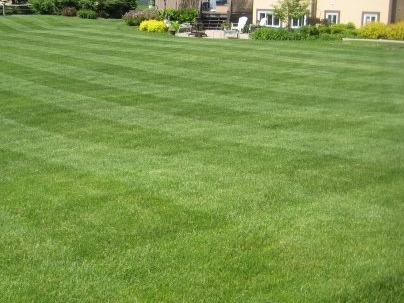 I don't understand why yards are supposed to look like the park in front of a 19th century English manor house. Yep, a sci'fi romance is definitely on my must write list. Now, about that goat idea, I love it and I want one. Thing is I have no place to keep her through the winter. sigh Maybe I need to build a small barn too. Hi Sally, me neither. I'd far rather have a yard full of food growing. Go, Pru! I started a vegetable garden last year (the first year I had land to do it in) for many of the same reasons. So far it's been a bit of a roller coaster (weeds are a never-ending battle) but also very satisfying. You might want to look into raised-bed gardening, square-foot gardening, or straw-bale gardening — all of these are supposed to make your garden easier to take care of (less weeding) and give you a higher yield. If you don't know what you're doing (like we don't! ), I suggest experimenting to learn what grows easily in your soil and climate. So far we've had the best luck with tomatoes, zucchini, and mint — but be wary of mint because it spreads. And start small so you don't get discouraged. Good luck planning and dreaming over the winter!